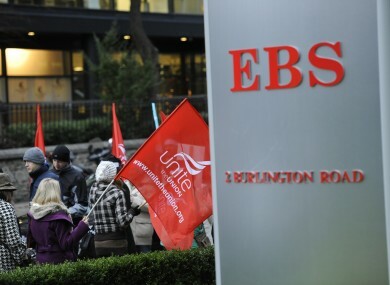 UNITE HAS INSTRUCTED its members within EBS Building Society to serve notice of strike if no satisfactory resolution is achieved in talks by this coming Monday. The union held a meeting yesterday evening to consider further action following the breakdown of talks at the Labour Relations Commission earlier this week. Following a briefing from union official Colm Quinlan, the meeting passed a motion proposing the action, by an overwhelming majority. Members are now instructed to serve notice of a one-day strike, as a first step in escalated industrial action, on a date to be specified, but to take place no later than 30 September. The union will engage in talks with management until Monday and if all outstanding issues are not satisfactorily resolved, formal notice of action will be served the following day. This dispute centres around payment of a so-called 13th month which was a contracual element of annual pay that was discontinued in EBS in 2011. The Labour Court held that this payment comprised a bonus and was therefore prohibited following the incorporation of EBS into AIB. However it held that this prohibition did not apply to the 2011 payment and recommended that the company pay the two weeks still owed for that year, which it has failed to do. Speaking after the meeting yesterday, Quinlan said that the workforce had displayed what he termed “extraordinary patience” throughout the process which culminated in Monday’s breakdown of talks, and he said members were “astounded that an institution now owned by the state should blatantly disregard a recommendation made by the same state’s supreme body for resolving disputes”. Email “Strike threat looms for EBS”. Feedback on “Strike threat looms for EBS”.